What do you get for that special knitter or crocheter in your life for the holidays? 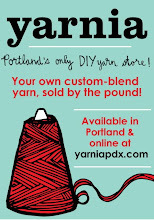 Well, yarn of course, and of that we have plenty! If you don’t trust your own yarn knowledge to pick out yarn for another, you can always come into the shop or hop on the chat that you see in the bottom left corner of our website and ask for advice. But we also have some other great options for you to choose from, including the experience of letting them design their own custom yarn, themselves. Show your love for Yarnia with one of these adorable tote bags! They fold up into themselves, forming a super compact, lightweight little ball with a stretchy cover when you’re not using them…and when you are, they hold up to 35 pounds (of yarn)! Available in 7 different colors (all printed white), with a felt shoulder patch to keep loads feeling light. Made from ripstop nylon: premium, durable, and machine-washable. Each includes enough yarn to make the given project, and a pattern tucked inside the cone. A gift card to Yarnia serves the dual purpose of augmenting your friend’s stash with some beautiful, one-of-a-kind yarn, as well as giving them the experience of creating their very own custom blend, so it will be exactly what they’re looking for! Our gift cards can be ordered in any amount, and are redeemable for any of the custom yarn, premade yarn, needles, notions, or classes that we offer here at the store. When ordering our gift cards online, there are lots of options! We will send the actual card to you (or your recipient if you prefer) in the mail, we can include a personalized note if you’re sending it directly to its recipient, and we can even activate it so that it’s redeemable in our online shop, as well. And, if you’re under a time crunch, we can even scan it before we drop it in the mail and email you a PDF version so that you’ll have something tangible to give, if the hard copy card hasn’t arrived in the mail yet. Just let us know! You can buy a Yarnia Gift Card right up until Christmas Eve! Win a $15 Gift Card by Taking Our Annual Customer Survey!